Do you know the value of every dollar you earn? Do your children know the value of theirs? We spend on average 30% of our lives working. That is over 2000 income-earning hours every year. 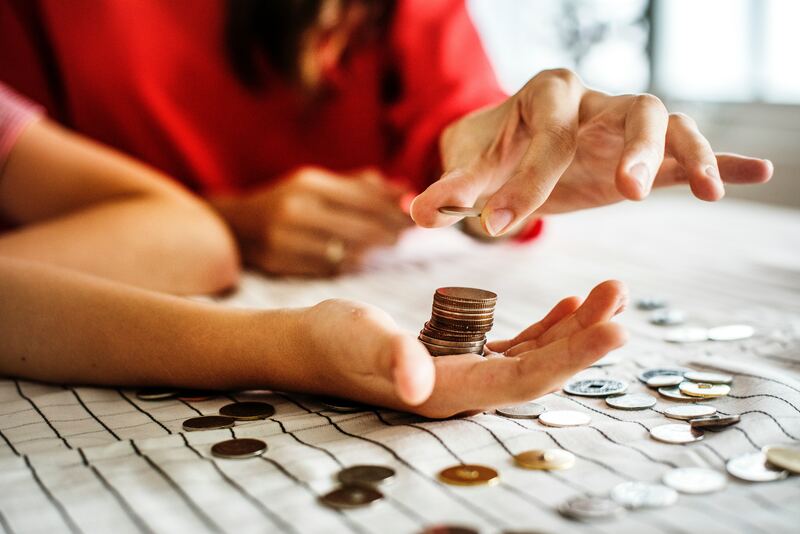 With 78% of people living paycheck to paycheck in the United States, many of us feel as though we are never able to stretch those hard-earned dollars far enough. How can we break the cycle of feeling as though we are barely making ends meet and begin to educate ourselves and our children on how to maximize our earnings? The answer is: by knowing the value of every dollar we earn, spending or saving our money with discipline, and teaching these skills to our kids. Our children are growing up in a society where it has been made much easier to spend than it is to earn. Every day, the temptations of advertising and marketing marked by the lure of FOMO (“fear of missing out”) and YOLO (“you only live once”) lead us to want to make purchases in the moment, without questioning the true cost of an item or the real value of every dollar spent. Cash flow law is such that when we spend today, we have less for later. As of 2018, the Federal Reserve marks that our spending habits have resulted in over $1 trillion in credit card debt (held by Americans alone). We are spending far more than we are earning. This doesn’t have to be the story for our future generations. We can help our children proactively address and shift the debt-driven trend and ensure that they don’t have to live paycheck to paycheck. Let’s dive further into the solution to our current cash crisis (the reduction of our debt and learning to live within our means): learning (and teaching our children) the value of money and looking for the best way to spend (or not spend) it. Think back to your first job. Were you taught the true value of the money you were earning? How would it have changed your financial trajectory if someone had shown you the value of each dollar earned – i.e. the time and effort it takes you to earn it? At CashCrunch, we help your children maximize their hard-earned dollars by teaching them the value of their dollar from the day they get their first allowance and ultimately when they start their first job. If your teen makes $10/hour, each dollar earned is worth 6 minutes of their time. If they are making $15/hour, each dollar earned is worth 4 minutes of their time. Likewise, for every $10-$15 your child spends in a store, it’s equivalent to an hour of their time at work. With this basic concept, our children and future generations can change the way they view their money in terms of its value and how they go about spending it. Think of the value of your every dollar and you’ll begin to see your purchases differently. In a world obsessed with materialism, instant gratification, YOLO and FOMO, we’ve somehow lost sight of the fact that we can only spend a dollar once. We need to teach our children to spend each dollar with care – to question their purchases. The differentiating factor between those who are struggling, living paycheck to paycheck, and those who feel they are maximizing their earned dollars is discipline: knowing the value of our dollar and the fact that we can only spend it once. Yes, we only live once (YOLO)…though so do our dollars. When a dollar has been allocated to saving or a purchase, it cannot be used again. Our children need to know that they cannot spend more than they earn…that there isn’t a money tree in the garden. How SODO leads to maximizing our earnings? The SODO theory is so effective because if our children know they can only spend a dollar once (and know the value of that dollar), they can make smarter spending decisions for the use of that money, thereby maximizing every dollar earned. A paycheck or an allowance is not a budget, it’s a beginning point for smart money choices. We can’t spend a dollar now and then still have it to pay for something later. In order to have money for later, we have to save it. Without considering the importance of saving today, we see the dollar in our pocket as a dollar we can spend. And the more dollars we have, the more we will spend. Before we know it, we’ve racked up thousands in debt and are living paycheck to paycheck. Teach your children to question the necessity of their purchases and put money away as saving for emergency expenses. This mindset, along with awareness of the value of their dollars will help them make the most of what they earn when they start out in the working world. · Comparison Shopping – Look for the best price. Don’t buy the first product that you see. Companies will lure you with coupons, price-matching and other marketing tactics. Also remember that cheapest isn’t always best. Factors like quality, longevity, warranties and store policies all need to be taken into account. · Opportunity Cost – This is the cost of choosing one option over the other (e.g. a branded versus non-branded purchase). Look for alternatives that will create more value for your money. When money is tight and we can only choose one item, it’s important that we choose right. · Save First, Spend Later – Budgeting, cash flow management and delaying gratification are practices that help us save today and spend later. By saving first, we empower ourselves to make smart money decisions, because we have less money to spend…which naturally makes us apply the comparison shopping and opportunity cost principles to our purchasing habits. · Earn to Spend – When we have a desired purchase, such as a new phone or car, we can calculate how many hours we have to work in order to have enough money to buy it (vs. that minute/hour value of our dollar!). Delayed gratification happens naturally when we employ this strategy, and it helps make our purchases feel that much more rewarding when earned. Without financial literacy, our youth and the generations of young adults are never going to get ahead of the game. Help your kids make sense of money through financial games and open conversations about money. Allow them to experience the value of their earned dollars and make cash-rich choices first-hand. Before we can begin the conversation about investing for the future or truly shifting our societal debt-driven trend, we need to talk to our children about mastering their money today. If we follow the rules, money maximization can be made easy. As parents and teachers, we can help our next generation rise from a life of struggling paycheck to paycheck to one of spending every dollar with discipline. Once you have spent it, you won’t get each dollar back…so where will YOU save or spend your next dollar?